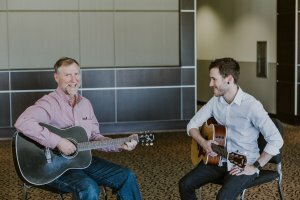 Ron teaches guitar lessons in Tulsa, Oklahoma. He has a love for teaching music and is a patient, kind, and well-trained instructor. After receiving a full-tuition music scholarship, he now holds a degree in Music Education from the University of Tulsa. Ron has taught students of all ages and abilities and has developed a highly effective method. He keeps organized records of each student’s progress to pick up exactly where the student left off each week. 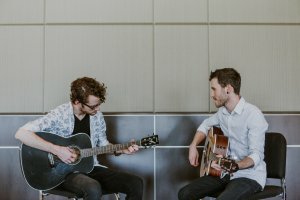 Whether you are just learning how to play or you are already a skilled musician, Ron can help you improve your technique and repertoire. Gain hands-on knowledge about live and studio equipment usage, sound, & effects. Ron’s inviting home studio in Tulsa, Oklahoma. Please see the video below where you will notice seating for guests, snacks, and a comprehensive drink station. Online via FaceTime or Skype. If you wish to have lessons at your residence and are within 10 minutes from the University of Tulsa, $5 compensation for gas and drive time is respectfully requested. Students will reserve a weekly time slot and receive a private lesson lasting 30 minutes or 1 hour once a week.